At 4:30 a.m. on November 27, 1985, a green and white colored Beechcraft C90 King Air, (Reg. No. N220F), with only a pilot and co-pilot aboard, left Morristown, New Jersey, bound for T. F. Green Airport in Warwick, Rhode Island. 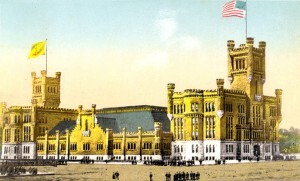 The purpose of the chartered flight was to pick up a female passenger at T. F. Green, and fly her to New York. About an hour later, as the aircraft was about eight miles from the end of Runway 5 at T. F. Green, it suddenly vanished from radar. The weather at the time was foggy, dark, and drizzly, with poor visibility. The crew had been operating on instrument flight at the time, and no distress call had been received. The pilot had filed his flight plan shortly before leaving New Jersey. At that time he was advised that there would be “moderate icing conditions” above 10,000 feet, and to expect “moderate turbulence” below 8,000 feet. The aircraft would be flying at 13,000 feet for most of the flight. The aircraft took off with full fuel tanks which amounted to 384 gallons. 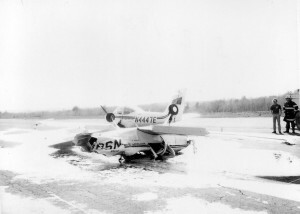 The aircraft was equipped with de-icing equipment which included a heated windshield and pneumatic de-icing boots on the wings. At about 5:30 a.m., as the aircraft was approaching T. F. Green, the pilot requested clearance to land on Runway 5, which is the airport’s longest, and was granted permission. The control tower at Green then relayed wind speed and barometric pressure readings to the crew. This was the last radio contact with the plane. The plane crashed and exploded in a wooded area to the north of South Road in the town of East Greenwich, leaving a large debris field. Both crew members were killed. Providence Journal Bulletin, “2 Die As Plane Crashes On Path To green; Cause Unknown”, November 28, 1985, Page 1, with photo of tail section. The Sun, (Westerly, R.I.), “East Greenwich Air Crash Kills Two”, November 27, 1985, page 1, with photo of tail section. On the morning of May 28, 1984, a Cessna 190 with a pilot and woman passenger aboard left Martha’s Vineyard bound for Ansonia, Connecticut. While passing over southern Rhode Island they ran into poor weather and the pilot decided to land until it passed. He was familiar with the area, and knew of a small private air strip on Green Hill, off Schoolhouse Road, in South Kingston. The airstrip was primarily used by the owner for take-offs and landing his ultralight aircraft. The pilot of the Cessna attempted to land but aborted the first two passes. While attempting his third, the airplane overshot the runway and crashed nose-first into a swamp. A witness to the accident was the first to reach the downed aircraft which was imbedded in soft marshy material, and discovered that both the pilot and his passenger were not injured. The aircraft suffered significant damage. At 6:40 p.m. on the evening of October 26, 1984, a Cessna Skyhawk with a husband and wife aboard left T. F. Green State Airport in Warwick, Rhode Island, bound for a small private airport on Prudence Island in Narragansett Bay, a distance of only six miles. The weather was overcast and raining at the time, with a cloud ceiling of about 300 feet and 1 mile visibility. By 8:25 p.m. the aircraft was reported as overdue and a search was instituted. The following day the aircraft was located upside-down in about eight feet of water in the channel that runs between Prudence and Patience Islands. The woman’s body was still inside, however the husband was missing. Divers who made the recovery reported that the pilot’s door was missing, and that the tail section had been torn away. On November 11, 1984, the body of the missing husband was located along the southern shoreline of Prudence Island. On September 28, 1980, a single engine Cessna 210, with a lone pilot aboard, left Georgia bound for Newport, Rhode Island. The 56-year-old pilot was coming to Newport to attend his daughter’s graduation from Naval Officer Candidate School. Shortly after 8:00 p.m. that evening, the aircraft landed at Quonset Point, and the pilot reported he was low on fuel. The aircraft took off about ten minutes later without refueling, bound for Newport Airport. At about 8:20 p.m. the pilot radioed that he was now out of gas and would be ditching in the water. Several witnesses reported seeing the Cessna crash into the East Passage of Narragansett Bay between Short Point and Hull Cove off Jamestown, and Butterball Rock in Newport. Despite an intensive search conducted by the Coast Guard, the missing aircraft could not be located, and the search was eventually called off. The missing plane and its pilot were found on October 21, 1980 when the fishing trawler Rose Jarvis accidentally snagged the wreckage in its nets near Hull Cove. The aircraft was badly damaged but still intact. It was brought to Middletown, Rhode Island, for examination. On the morning of January 26, 1980, a lone pilot took off from Islip, Long Island, New York, in a single-engine Cessna 150 for a 300 mile cross-country navigational flight. 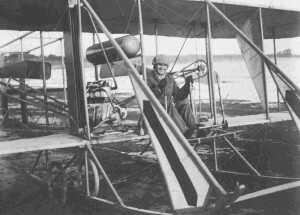 His flight plane included flying from Islip to North Central State Airport in Smithfield, Rhode Island, then on to Columbia, New York, and then back to Islip. 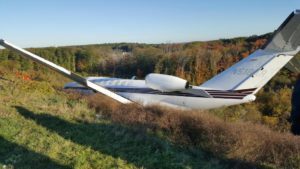 At about 10:40 a.m., while passing over western Rhode Island, the Cessna developed engine trouble, and the pilot was forced to make an emergency landing. He set the plane down in a six acre field in Foster. As the aircraft bounced along the frozen ground, it suddenly hit a dip which sent it into a line of trees behind a cemetery where it hit the trees at about 40 mph and came to rest on its nose. The field was located adjacent to North Road, about a half-mile from Route 94. The aircraft didn’t burn, and the pilot was able to extricate himself. He was not injured. Providence Sunday Journal, “Pilot Climbs Out Of Cessna Uninjured After Ramming Trees In Foster Landing”, January 27, 1980, page A-16, with photo of crash scene. On the evening of August 22, 1980, two men left Quonset State Airport in a single-engine Piper PA-18, (N9863D), bound for Griswold, Connecticut. Shortly after taking off the engine began running erratically, and the pilot attempted to make an emergency landing in a field in the town of Exeter, about a half mile off Glen Rock Road. The field was overgrown with brush, and the plane crashed, killing the pilot and seriously injuring the passenger. The passenger spent the night huddled under one of the wings. The following day searchers spotted the wreckage from the air, and rescuers transported the injured man to Kent County Hospital for treatment. On July 22, 1976, a 31-year-old pilot from Narragansett, Rhode Island, was working as a “spotter” for a commercial fishing vessel based out of Point Judith, R.I.. His job was to find schools of swordfish and radio their location to the boat. At about 4:30 p.m., crewmen aboard the fishing vessel saw the aircraft suddenly go down in the water and sink. An extensive search followed, but no sign of the plane or its pilot could be found. The Narragansett Times, “Crash Victim Search Ends”, July 29, 1976, page 2. At 11:30 a.m. on July 20, 1976, a single-engine Cessna 172 with two brothers aboard took off from Fall River, Massachusetts, for a sight-seeing trip over the Narragansett Bay and Newport, R.I. area. About an hour later, as the aircraft was circling the bay, it developed engine trouble and began losing altitude. The pilot radioed a distress call to Fall River, and airport tower officials tried to provide suggestions for restarting the motor, but nothing worked. Before long the aircraft was only 50 feet over the water, and the pilot was forced to make an emergency landing. The plane hit the water about 150 feet from shore off a beach in Tiverton, located about 1.5 miles north of the Sakonnet River Bridge. As it sank, one brother crawled out through a window, while the other managed to get his door open. While one brother made it to shore on his own, the other struggled in the choppy water due to a health condition. As Debby began to make her way towards shore with him, she encountered five other teenagers who swam out from shore towing a skiff. They were unable to row the boat because there was only one oar. After getting the man into the boat, they all worked to get it to shore. The other five youths were identified as: Gary Paquin, 17, Paul Simpson, 21, Peter Glewski, 15, Thomas Mc Mahon, 15, all of Tiverton, and Michael Morrissey, 15, of Pawtucket. Both brothers were transported to St. Anne’s Hospital in Fall River for treatment of non-life threatening injuries. At about 1:00 a.m., on the morning of September 27, 1975, a Falcon cargo jet belonging to an express company landed at T. F. Green Airport in Warwick, Rhode Island, after being diverted from its original destination of Boston’s Logan Airport due to low visibility conditions over Boston. Aboard the Falcon was a pilot and co-pilot, and one passenger. Among its cargo were some low-grade radioactive materials, minor explosives, and flammable liquids. About an hour later the Falcon was given clearance to resume its journey. The tower gave instructions to use Runway 23 left for take off. At the time clearance was given, a fog and drizzle condition existed at Green, and the pilot inadvertently turned onto Runway 23 right, instead of 23 left. Unbeknownst to the Falcon pilot, Runway 23 right had been closed since 5:25 p.m. the previous evening, and two large passenger jets, an Allegheny Airlines DC-9, and an American Airlines 727, were parked about halfway down the 5,000 foot runway and were not visible to the flight crew. The airliners were not occupied at the time, except for one maintenance man working aboard the DC-9. Although the runway was closed, the runways lights were still on, which investigators later determined contributed to the accident. The Falcon began its take-off run and reached a speed of 100 mph before its left wind struck the nose wheel of the DC-9 causing damage to the wing and nose wheel. The initial impact did little to slow the Falcon, which continued on and slammed into a maintenance truck which had also been parked on the runway, sending the truck tumbling under the left wing of the 727. The truck erupted in flames and burned furiously beneath the fuel laden wing of the 727. After colliding with the truck the Falcon’s main landing gear collapsed and the jet skidded to a stop about 150 yards later. The plane did not catch fire and the crew and passenger scrambled out through a cockpit escape hatch – unhurt. Due to a quick response by the airport fire department the burning truck was extinguished and the fuel in the wing of the 727 did not ignite, although the aircraft did suffer serious damage from the burning truck. The lone maintenance man aboard the DC-9 was transported to a medical facility to be treated for shock. None of the materials aboard the Falcon jet were found to be leaking or in any way compromised. Providence Journal Bulletin, “Radioactive-Cargo Plane Crashes At State Airport”, September 28, 1975. Westerly Sun, (RI), “Faulty Lights Crash Factor”, October 5, 1975, page 9. Providence Journal Bulletin, “State Seeking Dismissal Of Runway Crash Suit”, December 4, 1976, page 8. On January 22, 1966, a Piper Cherokee owned by the Newport Air Taxi Co. of Newport, R.I., was coming in for a landing at T. F. Green Airport when it was involved in a mid-air collision with a Cessna 150 owned by Wille Aero Inc. The Cessna had an instructor and student aboard, and was making touch and go landings at the time of the accident. The pilot of the Cherokee was alone. The two planes collided about 100 feet above the airfield and came down just inside the airport fence near a residential area at the southern end of the airport. Everyone aboard both airplanes was killed instantly. The Boston Sunday Globe, “Planes Collide, 3 Die”, January 23, 1966, page 40. Filed Under: Rhode Island - Civil Tagged With: Newport Air Taxi Co, T. F. Green Airport Accident, T. F. Green Airport Fatality, T.F. Green Airport Crash, T.F. Green Airport History, Wille Aero Inc.
On August 17, 1966, a Cessna 206 took off from Black Island bound for Westerly Airport. Aboard the aircraft was the 28-year-old pilot and a 30-year-old woman passenger from New York. As the plane approached the shore of Westerly, the engine lost power, and the pilot was forced to make an emergency landing in the water about 1,600 yards off shore from Weekapaug Beach. Both escaped the aircraft before it sank, and were rescued a few minutes later by the crew of a two-masted sailboat named Camelot. A short time later they were transferred to a Coast Guard boat and ultimately transported to South County Hospital for treatment of minor injuries. On June 19, 1965, a Waterford, Connecticut, man left New London – Waterford Airport in a four-passenger Piper Comanche bound for Montauk Point, Long Island, New York. Ten minutes into the trip the aircraft developed engine trouble. The pilot attempted to radio a distress call on an emergency frequency monitored by the Federal Aviation Administration, rescue facilities, and airport control towers, but nobody acknowledged receiving the call. When the engine lost all power the pilot was forced to make an emergency water landing about three miles off Fisher’s Island, New York. The plane remained afloat for several minutes before sinking, during which time the pilot was able to stand on the wing and search for any passing boats but didn’t see any. After donning two life jackets, he began to swim towards Fisher’s Island. The water temperature was about 50 degrees, and after the first hour he began to tire. Finally a passing charter boat, Skipjack, happened upon him and he was rescued. Ironically, the boat’s captain was a former neighbor of the downed airman. Filed Under: Rhode Island - Civil Tagged With: Block Island Sound Plane Crash, Fisher's Island N.Y.
At 2:12 p.m. on January 13, 1913, aviator Harry M. Jones set out from Boston for New York City in a Curtiss bi-plane, with scheduled stops in Rhode Island and Connecticut along the way. This was to be the first parcel post flight in America, and among the letters and packages Jones was carrying were nine pots of Boston baked beans which were to be delivered to prominent public officials along the route. The first scheduled stop was in Providence, Rhode Island, and Jones landed in a baseball field off Elmwood Avenue just after 3:00 p.m. The following morning he resumed his journey. As he took off from the baseball field and began a wide circle around it, the aircraft was suddenly struck by a strong cross-wind and pushed towards some telephone wires and railroad tracks. 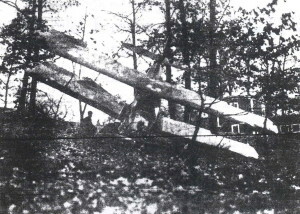 The crash landing broke several wooden ribs of the airplane which required two weeks to repair. Jones was not seriously injured. When he resumed his journey it was reported that his cargo included Rhode Island Johnny Cakes in addition to the baked beans. 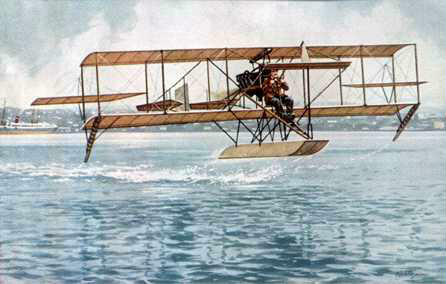 Harry Jones was involved in another plane crash in Rhode Island on May 25, 1913, when he crashed into Narragansett Bay. That accident is listed elsewhere on this website. On July 23, 1979, a 26-year-old pilot, and his 60-year-old female passenger, took off from Richmond, Rhode Island, bound for Westerly, R.I., to refuel the airplane as there were no fuel facilities at Richmond Airport. 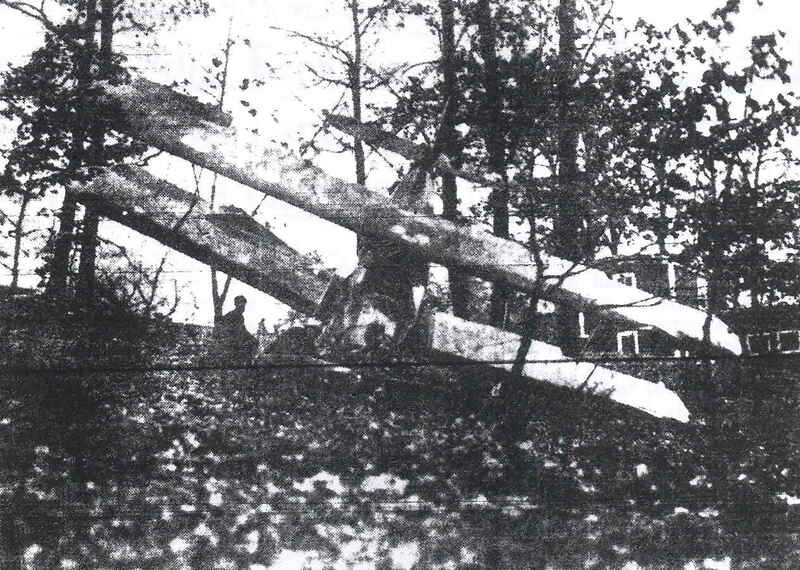 While passing over the town of West Greenwich, R.I., the aircraft crash-landed on an unused portion of St. Joseph’s Cemetery. After striking an open area of the cemetery, the plane bounded into some trees about 100 yards from the chapel, and 30 yards from Nooseneck Hill Rd., a.k.a., Route 3. Both the pilot and his passenger suffered serious injuries, and the aircraft was heavily damaged. The aircraft came to rest upside down with its tail up against a tree, and with one of its wings sheared off. It was further reported that the pilot had obtained his flying license the week before the accident. The aircraft was described as a 1973 single-engine Grumman AA1B. Westerly Sun, “Couple In plane Crash ‘Lucky To Be Alive'”, July 24, 1979, page 9. 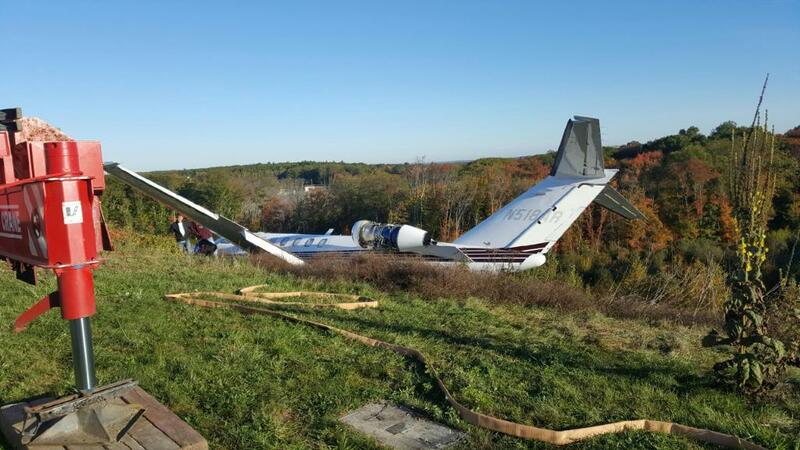 Providence Journal, “2 Hurt As Plane falls Near Rt. 3”, July 24, 1979, page 1. On August 30, 1986, a 32-year-old man from Glocester, Rhode Island, was piloting an ultra-light aircraft over the Scituate Reservoir with a video camera attached to his helmet, and a video recorder belted to his waist. Suddenly, while at an altitude of 700 feet, the small two-cycle motor abruptly stopped. The pilot didn’t know why the engine had quit, and as the aircraft began to fall he tried everything he could to re-start it, but was unsuccessful. As he approached the water he tried to set the plane down in a “nose up” position, but when the wheels hit the water the craft flipped over and began to sink about 100 feet from shore. As the aircraft went under, the pilot couldn’t get his seatbelt off, but finally managed to do so. Then, as he tried to swim to the surface, he found himself caught by the video recorder belt. As the plane settled on the bottom he managed to free himself and barely made it to the surface. He then swam to shore where he marked his location with a pile of rocks before setting out to find a telephone. A few days later police divers raised the ultra-light from the bottom, and recovered the video tape of the accident. On November 19, 1910, the balloon Cleveland, took off from North Adams, Massachusetts, with five men aboard. The craft was piloted by Leo Stevens, and carrying four Williams College students as passengers. Strong winds on the ground delayed the ascension for nearly an hour, but when it finally took to the sky the balloon “shot up like a rocket” before being carried away in an easterly direction. Three hours and thirty-five minutes later the balloon was over Rhode Island approaching Providence when it began to lose altitude. Ballast was dropped, but the balloon continued to fall, and appeared to heading for a large lake. The aeronauts were forced to strip off their clothing to lighten the weight in order to avoid a water landing. The tactic worked, and the balloon sailed across the lake before crashing onto the far shore. Upon impact, one of the occupants, H.P. Scharman was pitched out and received serious injuries. Thus relieved of significant weight, the balloon suddenly rose upwards leaving Scharman behind. It then continued onward several hundred feet, propelled forward by heavy winds, before it slammed into a stone wall. The crash sent the others tumbling out causing relatively minor injuries. 26-year old Charles B——–, of New Haven, Connecticut, was a new pilot, having only obtained his license six months earlier, so it was with trepidation that he looked over the field at Berkeley Airport in Cumberland and decided that he didn’t like what he saw. In his opinion, the field was too muddy, and he feared the Cessna 140 airplane that he planned to rent would either nose over or fail to gain sufficient speed to achieve altitude. Besides his own safety, there was his wife to consider, who planned on taking the flight with him. He expressed his concerns to the airport manager, who didn’t share the young man’s concerns. To prove it, the manager offered to fly the Cessna to Woonsocket Airport a few miles away and meet the couple there. Then, if they liked conditions there, they could take-off and return the plane to Berkeley. The couple agreed, and got a ride to Woonsocket airport from Officer John M. Roberts of the Woonsocket police who had been at Berkeley taking a pilot’s instructors course. 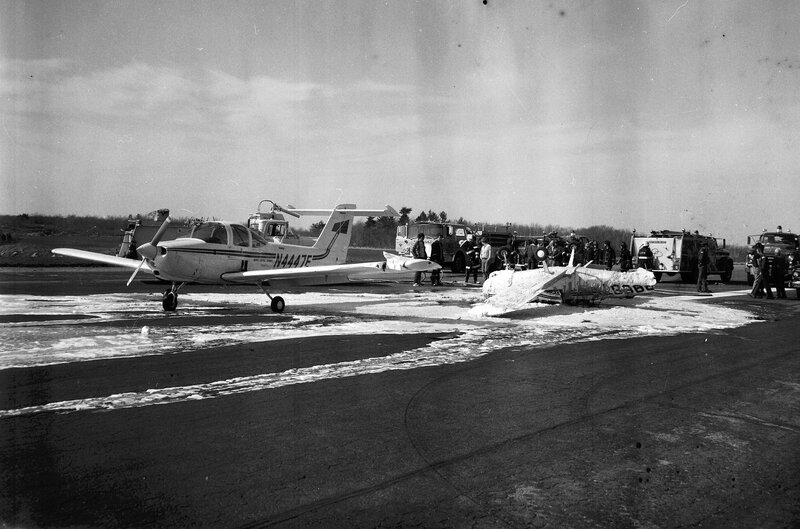 A short time later the couple stood at Woonsocket Airport and Mr. B——- decided it was safe to fly from there. The couple climbed into the airplane with the husband at the controls. All seemed well as the plane headed down the runway and into the sky, but then the plane went into a stall and nosed to the ground. The fall was broken in part when a wing struck some power lines before it crashed at the intersection of Diamond Hill Road and Bound Road. The severed power lines caused a delay in calling for help, so a bystander took the injured couple to Woonsocket Hospital in his private car. Fortunately their injuries weren’t serious. The airplane however, was a total loss. Ironically, it was the just this type of accident the husband was trying to avoid in Berkeley that happened in Woonsocket. At 2:55 a.m. on June 11, 1959, a small plane was attempting to land at Block Island Airport when it crash-landed about 250 feet from the end of the airport’s only runway. The pilot stated a sudden shift in the wind caused the plane to loose airspeed on final approach. The plane was a 1955 Beechcraft Bonanza low-wing monoplane which suffered significant damage. Fortunately the three men aboard escaped unhurt. The accident was investigated by the State Aeronautics Administration. At about 1:30 p.m. on August 25, 1974, a single-engine, one-man, “experimental” aircraft was seen passing over DeLuca’s Beach in the town of Narragansett, heading out over the water. Suddenly a loud “pop” was heard, and the aircraft spun into the water from an altitude of 200 feet. The airplane struck nose first, crumpling the front of the aircraft and pinning the pilot inside as the cockpit sank below the surface. Although the cockpit was underwater, the wreckage remained partially afloat about 250 yards from shore, in water estimated to be 40-50 feet deep. A man and woman from a nearby boat dove into the water to attempt a rescue, but were unsuccessful. They were relieved by six life guards who rowed out to the scene in two small boats, yet they couldn’t free the pilot either. When a Coast Guard vessel from Point Judith arrived the aircraft was towed to shore. There the body of the pilot was removed and transported to South County Hospital where he was pronounced dead. Shortly after 1 p.m. on November 17, 1970, a twin-engine Cessna 310 aircraft with a husband and wife aboard took off from T.F. Green Airport. Just after takeoff the plane lost power in its left engine and the pilot made a left turn in an attempt to get back to the runway. As he was doing so, the airplane came down in a neighborhood adjacent to the airport, where it skimmed the top of a tree located in front of 57-59 Kilvert Street. It then glanced off a three-story house before slamming into another three-story home at 51 Kilvert Street and exploded into flame. Inside 51 Kilvert Street, a 37-year-old mother lay sleeping with her 1-year-old son. The crash set the room ablaze. Her husband, who was out in front of the house at the time, ran in and rescued his wife and son, but the woman later died of her injuries. The occupants of the aircraft were pulled from the wreckage by firefighters, both were suffering from severe burns. The flames spread to an adjacent house, and four firefighters were injured battling the blaze. The burned homes were later torn down. “Mother, Infant Pulled Out After Plane Hits R.I. Home”, November 18, 1970. At about 11:30 a.m., on July 1, 1941, a small airplane with a man and a woman aboard left Newport Airport bound for New York City. The woman was Miss Eleanor Young, 23, and her companion was Nicholas S. Embirieos, 31. Both were known in society circles. As the plane flew across Narragansett Bay it encountered fog conditions. Embirieos, who was at the controls, circled the area of Matunuck Beach several times before the aircraft suddenly crashed into the water just off shore of Matunuck Beach, a popular swimming area in South Kingstown R.I. Both occupants were pulled from the wreck by lifeguards, George Gilson, and David Smith, but died of their injuries. 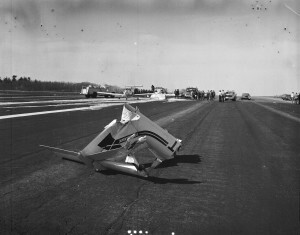 A photograph of part of the plane wreckage can be found on page 53 of the book, “Images Of America – South Shore Rhode Island”, by Betty J. Cotter, 1999. On May 25, 1998, a single-engine Beechcraft Bonanza with four people aboard took off from Nantucket, Massachusetts, bound for Connecticut when it developed engine trouble while in-route. 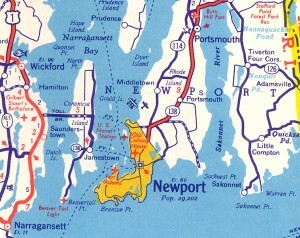 The nearest airport at the time of the trouble was Rhode Island’s Newport State Airport, which is actually in Middletown, Rhode Island. As the plane was making its approach, it crashed into a tree at the edge of a field off Jepson Road in Middletown and burst into flame. Two people in the rear of the plane managed to escape, but the two in front perished. The survivors were transported to Newport Hospital and were later transferred by helicopter to hospitals in Massachusetts. On the evening of July 27, 1913, Rhode Island aviator Jack McGee was making flights from Crescent Park in East Providence, Rhode Island. After making a solo flight at 5:30 p.m., he landed and took off again with his younger brother Robert as a passenger. At about 6:30 McGee then made a third flight, this time with an unidentified friend as a passenger. As the plane headed out over the Providence River a chain to one of the propellers suddenly snapped and the aircraft began to fall. There was nothing that McGee could do, and the plane dove nose-first into the river just off the Bullock’s Point Lighthouse, and sank to the bottom taking both men with it. Fortunately the water was only 20 feet deep. McGee was able to free himself, and then assisted his passenger from the tangled wires of the wreck, and both made it to the surface with relatively minor injuries. The aeronauts were rescued by a passing boat and brought to shore. The Bullock’s Point Lighthouse was destroyed by the Hurricane of 1938. On the evening of October 20, 1999, a Delta Airlines jet, (Flight 2049), en-route to Atlanta, Georgia, was taking off from T.F. 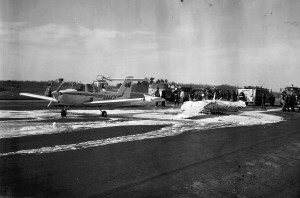 green Airport in Warwick, Rhode Island, when a tire blew out as the plane was becoming airborne. Pieces of the tire were sucked into the number 2 engine setting it on fire and causing some smoke to filter into the cabin. At 6:28 p.m. the pilot declared an emergency and diverted to Boston’s Logan Airport, for it would have taken just as long to turn around and attempt to return to Green. 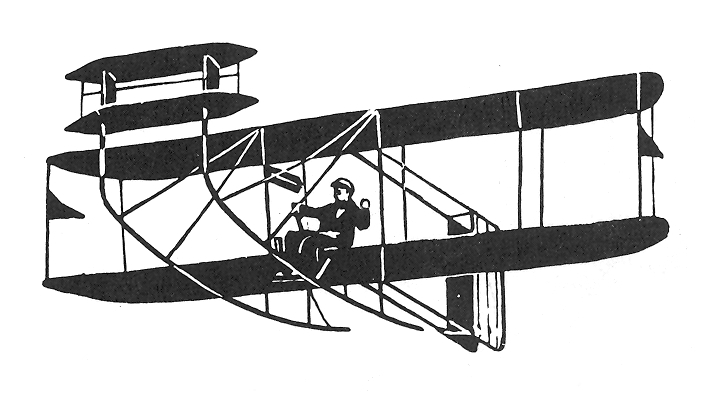 (This type of aircraft can fly with just one engine.) Seventeen minutes later the plane landed safely at Logan at 6:45 p.m.
None of the passengers and crew aboard were injured, but two women were transported to a local hospital; one for anxiety, the other due to suffering a seizure. The aircraft involved was a McDonnell Douglas MD-80. On September 30, 2002, Suzanne Costa, 35, of New Bedford, Massachusetts, went to North Central State Airport in Smithfield, Rhode Island, to do some skydiving. This was to be her 17th jump. When Costa jumped, she landed near a Cessna aircraft that was getting ready to take off with other skydivers aboard. 22-year-old Daren Fiske was assisting the skydivers get aboard when he saw Costa land in front of the plane. Her parachute fell across the spinning prop and she was pulled in. At the same instant, Fiske tackled Costa and held on as the pilot quickly cut the engine. Although seriously injured, Costa recovered from her injuries. Boston Herald, “Skydiver Survives Propeller Accident”, by Franci Richardson, October 1, 2002. Shortly before 8:30 p.m. on the evening of July 9, 1978, a Piper Cherokee, (#N-5254S), took off from Westerly Airport with four people aboard, bound for Red Hook, New York. Heavy fog and low cloud cover blanketed the area making for hazardous flying, but the experienced pilot was certified in instrument flight. As the aircraft took off, it began a long slow turn to the right. Meanwhile, a man was hitting soft balls to a group of boys in a field off East Avenue, not far from the airport. He later told reporters that he’d heard the low flying aircraft before he saw it come out of the 100 foot cloud cover and crash. He related how the aircraft came out of the clouds so low that he yelled for the boys to duck as it passed overhead. The plane then banked to the right as the pilot tried to avoid some trees, and the right wing dropped and dug into the soil, causing the nose to slam into the ground. The aircraft then cartwheeled for about 100 feet before coming to rest. All four occupants perished, but nobody on the ground was injured. 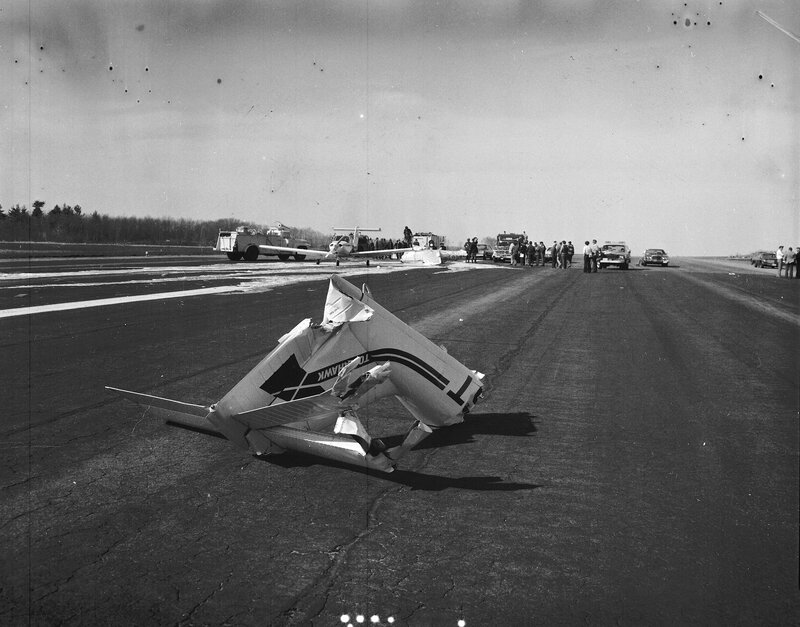 On June 19, 1965, a small plane with two men aboard crashed while attempting an emergency landing at Westerly Airport. Both men were killed. The dead were identified as (pilot) Robert White, 25, of Stratford, Ct., and Herman Stephens of Moosup, Ct..
On June 25, 1978, a local man went to North Central State Airport to fly his aircraft, a Grumman AA-1A, and discovered that the battery was dead. A 19-year-old mechanic went to assist, and attempted to hand-start the plane. When the engine suddenly kicked over, the propeller blade struck the mechanic in the head causing an open fracture to his skull. He was rushed to a nearby hospital and underwent surgery, but succumbed to his injuries on June 30th. Woonsocket Call, “Propeller Accident Injures Mechanic”, June 25, 1978. On May 25, 1947, Harold H. Horning, 25, was attempting to take off from Berkley Airfield in Cumberland, when the engine suddenly lost power just after he had left the ground. Horning managed to maneuver the aircraft away from a group of boys playing baseball at the far end of the field just before crashing. The aircraft was wrecked, but Horning, and his two passengers, (brother) Edward Horning, 30, and Raymond Paquette, 46, all escaped without injury. Berkley Airfield once existed in the Berkley section of the town of Cumberland, R. I..
On the morning of August 28, 1935, veteran pilot Joshua Crane Jr., 37, began his final approach to a temporary field adjoining Hillsgrove Airport from an altitude of 1500 feet. Crane was flying a Waco, model YOC, (NC-14621), a four passenger aircraft. Also aboard was Arthur E. Howe, 26, of Philadelphia. Both were en-route from Boston to Cleveland, Ohio, and were stopping at Hillsgrove to pick up a third man, Arthur L. Johnson of Cranston. The weather was clear with a southwest wind of 20 miles per hour and gusty. When the plane had dropped to 500 feet, a gust of wind sent it into a left spin and it plunged to the ground in a small lot on Occupassatuxet Road in Warwick’s Hoxie section, miraculously missing any houses in the area. (Occupassatuxet Road no longer exists. It was taken by eminent domain during an airport expansion project.) The impact drove the plane’s motor into the passenger cabin causing severe crushing injuries to both men. Bystanders pulled Crane and Howe from the crumpled wreck and both were transported St. Joseph’s Hospital in critical condition. Crane died shortly afterwards, and Howe was reportedly only given a 50-50 chance of survival. The death of Joshua Crane came as a shock to the New England aviation world, for he was regarded as an excellent pilot throughout the region. He began flying after graduating from Harvard University in 1917 at the age of twenty. At that time, World War I was raging in Europe and he enlisted in the United States Navy as a pilot where he received training at Squantum, Massachusetts, and Hampton Roads, Virginia. By 1918 he was stationed in England flying anti-submarine patrols trying to prevent German U-boats from attacking convoys. While in England, he met his future wife Dora, and they married in 1920. After leaving the navy, he continued flying in the relatively new sport of air racing where his reputation grew. Besides racing, he also became involved with several air-passenger service ventures that flew out of Rhode Island, and Massachusetts. By 1930 he had become general manager of Southern New England Airways, Inc., a long defunct service that once flew out of Pawtucket, Rhode Island. During the literally thousands of hours he logged in the air, it was estimated that he had transported more than 25,000 passengers. In addition to passengers, he also flew humanitarian missions and ferried people for the government. On one occasion he flew from Boston with a planeload of prisoners destined for the federal penitentiary at Lewisburg, Pennsylvania. Shortly before his death, he had taken Rhode Island’s Governor Theodore Francis Green and a military aide to an army camp in upstate New York to observe war games. The plane that the governor flew on was the same one that Mr. Crane was piloting the day he crashed. Like many pilots, Crane had his share of “close calls”. One incident occurred in November of 1930 when a glider he was piloting went down in Pawtucket. Neither he nor his two passengers were seriously hurt. In April of 1933 his plane loaded with passengers crash landed in southern Rhode Island when the motor lost power, but thankfully those aboard suffered only minor injuries. Then in July of that same year the landing gear collapsed as he touched down at an airport in Skowhegan, Maine. In February of 1934 he became stranded on an island that he owned known as “No Man’s Land” located about three miles off the southern coast of Martha’s Vineyard, Massachusetts. (Today the island is known as “Normans Land”). On that occasion, he had “nosed-over” on landing and damaged the propeller which forced him to wait until the Coast Guard could bring a new one. This possible malfunction of the flaps, combined with gusty wind conditions, may have led to the crash. The Woonsocket Call, “Joshua Crane Jr., Dead, Passenger Injured In Crash”, August 28, 1935, Page 1. The Providence Journal, “Joshua Crane, Jr., Fatally Injured As Plane Crashes”, August 29, 1935, Page 1. 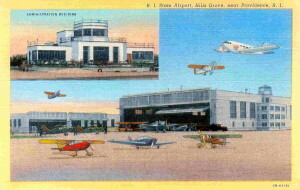 On December 22, 1940, two aircraft, each flown by student pilots, collided in mid-air directly over Hillsgrove Airport. One, an Aeronca Cub, flown by Gilbert B. Kornstein, 19, and the other a Taylorcraft, flown by Millard McInnis, 26. The impact broke the tail off the Aeronca, sending it plummeting to the ground killing Kornstein instantly. McInnis was able to nurse his damaged plane down, clipping a tree and flipping over in the Norwood section of Warwick, about three miles from the airport. He required a tourniquet to stem the flow of blood from a leg wound, but he survived. The pilot, identified as Lieutenant Arthur Manning, told investigators that the plane developed engine trouble just after take off. The dead were identified as Mrs. Fred Hunter of 3 Avery Street, Westfield, Massachusetts, and Miss Marie Day, of 20 Cotton Avenue, West Springfield, Massachusetts. No autopsies were performed. There was no mention as to a specific aircraft- military or civilian – in the news article. Source: Woonsocket Call, “Fatal Airplane Crash Probed”, September 4, 1929, Pg. 3.